Located in Palm Beach County and boasting a population of about 37,000 people according to the 2010 U.S. Census, Greenacres is a city that is expanding and growing. This expansion and growth comes at a price, however. Whenever any community such as Greenacres Florida expands and incorporates additional families and individuals, more vehicles begin to appear on city roads and highways. This results in an increased likelihood that you or your loved ones will be injured or hurt in a car accident, truck crash, or other motor vehicle collision. In 2016 in Palm Beach County alone, there were 16,565 individuals injured and 177 people killed. This statistic related to car accidents is from the Florida Department of Highway Safety and Motor Vehicles with some of these types of automobile accidents occurring in Greenacres Florida. It is unfortunate that a majority of these motor vehicle accidents are preventable. Many end in long term personal injury and disability, but many of the more severe end in death. The number one culprit is distracted driving. Though a main contributor, and the most preventable, texting only attributes to about a third of distracted driving accidents. Move yourself and your vehicle to a safe location, if you can do so safely and without causing further injury to yourself. If you suspect you may have suffered a head, neck, and spinal column injury, it may be best to remain where you are and summon emergency assistance to your location. Seek medical treatment as soon as possible, even if you feel alright. Unless you are certain that you suffered no injuries or only minor injuries, it is usually a good idea to seek medical evaluation and treatment to make sure you are not suffering from internal trauma or injuries that have not yet manifested symptoms and signs. If you hit your head or hurt your neck, prompt evaluation and treatment can be especially crucial to minimizing any long-term damage such injuries may have caused. Take down information about the at-fault driver(s) and any witnesses who saw the crash or rendered aid to you or others. While Florida continues to follow its “no-fault” insurance statutory scheme for the time being (wherein the insurance provider for each motorist involved in a crash pays the claim of its own insured), an injured motorist may be able to file a traditional fault-based car crash lawsuit when the driver or passenger has suffered catastrophic injuries or has been permanently disabled. This type of “no fault” injury insurance is referred to in Florida as Personal Injury Protection insurance or PIP. PIP will typically pay for an injured person’s medical bills, a portion of lost wages, or house hold services. 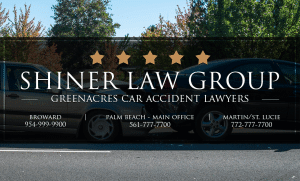 If you have questions regarding car insurance after your automobile accident call the lawyers at Shiner Law Group located near Greenacres Florida for a free telephone consult. Our car accident attorneys have helped numerous injured individuals in Greenacres and the surrounding Palm Beach County. If this is the case, having witnesses available who can accurately testify as to how the crash occurred can be instrumental in succeeding in such a suit. Of course, one of the most important steps to take after a crash is to contact an experienced and knowledgeable Greenacres car accident law firm such as the Shiner Law Group for guidance and direction. Our personal injury firm can review the circumstances surrounding your crash as well as the severity of your injuries and advise you as to how your case may proceed. Where a claim is submitted to your insurance company, we can help make sure your claim is timely processed and paid. In the event you suffer serious and permanent injuries, we will help you in filing and succeeding in a car crash lawsuit. At Shiner Law Group, our skill and commitment to our Greenacres car accident clients are reflected in our firm’s 10.0 AVVO rating, our AV Preeminent Rating by Martindale-Hubbel, and by our recognition for client satisfaction by the American Institute of Personal Injury Lawyers. 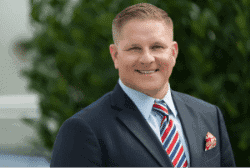 The car accident lawyers at the Shiner Law Group are consistently awarded recognition for being top rated personal injury attorneys in Palm Beach County and surrounding areas such as the city Wellington, Greenacres, and West Palm Beach Florida. Call our firm today at 561-777-7700 or reach out to us online and schedule your free case review with our legal team today.